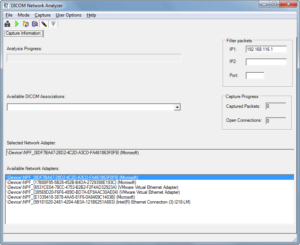 The DICOM Network Analyzer allows you to quickly and easily capture DICOM TCP/IP packages from the network. It automatically gives you an overview of the DICOM sessions and messages within each session. Deep inspection of all network messages down to PDU level and message validation. Capable of saving capture files and extracting DICOM files from the captured data. Easy to use and set-up. The application is easy to use but also provides powerfull features to the more advanced user. The application is easy to set-up and less complicated than applications like Ethereal. That is making it the perfect solutions for service engineers that need to provide support in production environments. The advanced features make the tool also ideal for developers and test engineers that want to know exactly what data is being send over the line and get a quick validation report on the send data.